Accurate information regarding the expected complications of complex adult spinal deformity (ASD) is important for shared decision making and informed consent. The purpose of the present study was to investigate the rate and types of non-neurologic adverse events after complex ASD surgeries, and to identify risk factors that affect their occurrence. The details and occurrence of all non-neurologic adverse events were reviewed in a prospective cohort of 272 patients after complex ASD surgical correction in a mulitcentre database of the Scoli-RISK-1 study with a planned follow-up of 2 years. Logistic regression analyses were used to identify potential risk factors for non-neurologic adverse events. Of the 272 patients, 184 experienced a total of 515 non-neurologic adverse events for an incidence of 67.6%. 121 (44.5%) patients suffered from more than one adverse event. The most frequent non-neurologic adverse events were surgically related (27.6%), of which implant failure and dural tear were most common. In the unadjusted analyses, significant factors for non-neurologic adverse events were age, previous spine surgery performed, number of documented non-neurologic comorbidities and ASA grade. On multivariable logistic regression analysis, previous spine surgery was the only independent risk factor for non-neurologic adverse events. The incidence of non-neurologic adverse events for patients undergoing corrective surgeries for ASD was 67.6%. Previous spinal surgery was the only independent risk factor predicting the occurrence of non-neurologic adverse events. These findings complement the earlier report of neurologic complications after ASD surgeries from the Scoli-RISK-1 study. Kenny Yat Hong Kwan and Cora Bow have contributed equally to this work. The online version of this article ( https://doi.org/10.1007/s00586-018-5790-y) contains supplementary material, which is available to authorized users. Surgery for adult spinal deformity (ASD) has increased in magnitude and complexity, and often deformities require three-column osteotomies (3COs) such as pedicle substraction osteotomy (PSO) or vertebral column resection (VCR) [1, 2, 3, 4, 5, 6, 7]. While operative management is known to be associated with greater quality-adjusted life years than non-operative treatment , complication rates of up to 50% have been reported in this patient population [1, 2, 7, 9, 10, 11, 12, 13, 14, 15]. Apart from one recent study , most of the data came from retrospective cohorts with poorly defined inclusion criteria and lacked validated assessment systems. As a result, they are subject to biases that may lead to underestimation of the actual risks involved. The Scoli-RISK-1 study was the first prospective, multicenter, international study to address a complete risk profile after ASD surgeries. The postoperative neurologic data have been reported , which showed a new neurologic deficit rate of more than 20% after complex ASD surgeries. This is much higher than the previously reported rates which ranged from 1 to 10% [1, 4, 9, 10, 11, 17, 18, 19, 20, 21] and has been attributed to the prospective nature of this study with rigorous assessment and documentation required from each participating site. However, ASD surgeries are also associated with non-neurologic adverse events [6, 9, 15, 19, 20, 22, 23, 24, 25]. Knowledge of the true incidence, types and risk factors for non-neurologic adverse events after ASD surgeries is integral for a complete risk profile assessment, preoperative counseling process and establishing future preventative measures. To address the aforementioned limitations, the aim of this study was to report the rate and types of non-neurologic adverse events after surgical intervention, and to identify risk factors that affect their occurrence in patients with complex ASD who represented the Scoli-RISK-1 cohort. This was a prospective, multicenter study that recruited patients from fifteen investigational sites in North America (nine), Europe (three) and Asia (three) with 2-year follow-up as part of the Scoli-RISK-1 initiative. Key inclusion criteria were as follows: ages between 18 and 80 years at the time of surgery, a major Cobb angle of ≥ 80o in the coronal and/or sagittal planes, presence of preoperative myelopathy, ossification of ligamentum flavum (OLF) or ossification of the posterior longitudinal ligament (OPLL) with deformity, and patients who had undergone corrective osteotomy or three-column osteotomy. Patients with a recent history of substance dependency or psychosocial disturbance, spinal trauma or injury, malignancy, and those who are pregnant, institutionalized, or unlikely to comply with follow-up were excluded from the study. Ethical approval was obtained from the local ethical committee or institutional review board of each participating site. Written informed consent was given by all patients. The study is registered with clinicaltrials.gov under NCT01305343. All non-neurologic adverse events were recorded as a pre-defined category or as “other,” including a detailed description. For the purpose of reporting, surgery-related adverse events were pre-defined to include dural tear, cerebrospinal fluid leakage, implant-related problems, fracture, visceral or vascular injury and graft problems. Every recorded non-neurologic adverse event was evaluated by a Clinical Endpoint Committee (CEC) for its accuracy and re-categorized as necessary. Patient demographics, medical history, surgical data and the occurrence of non-neurologic adverse events were reviewed. Adverse events were classified as perioperative (intraoperative and those occurring within the first 6 weeks after surgery) and late (those occurring after 6 weeks). These adverse events were also categorized into major or minor according to Glassman et al. (Table 1). All non-neurologic adverse events recorded by the participating spine surgeons were included. Descriptive statistics, such as mean, standard deviation, percentage and frequency, were used to summarize demographic data and surgery details. Non-neurological adverse events rates along with their 95% confidence interval were calculated using exact Clopper–Pearson limits. Univariable and multivariable logistic regression analyses were performed to identify risk factors for the occurrence of any non-neurological adverse events. According to the rule of 10 events per variable , nine factors were selected to be included in the univariable and multivariable analyses based on published literature [14, 27]. The selected variables were age (per 10-year increase), body mass index (BMI) (25.0 to < 30.0 vs < 25.0; ≥ 30 vs < 25 kg/m2), number of documented comorbidities, previous spine surgery, preoperative Lower Extremity Motor Score (< 50 vs 50), American Society of Anesthesiologists (ASA) grade, total operative time (per 1 h increase), total estimated blood loss (per 500 cc increase), and whether a three-column osteotomy was performed. Results from the logistic regression analyses were expressed as odds ratio (OR) with 95% confidence intervals (CI). A p value of less than 0.05 was considered statistically significant. The statistical analysis was performed using the software SAS version 9.4 (SAS Institute Inc., Cary, NC). There were 272 patients (183 female and 89 male), and the mean age at the time of surgery was 56.9 ± 15.3 years (range 18–81 years). The average number of levels involved in the surgery was 11.7 (range 3–23 levels). The baseline characteristics of the patients are shown in Table 2. One hundred and sixty-nine (62.1%) patients had previous spine surgeries, and 212 (77.9%) patients had one or more non-neurologic comorbidities. The mean total operative time was 448.5 ± 164.4 min, with an estimated total blood loss of 2639.0 ± 2008.8 ml. Two hundred and six (75.7%) patients underwent a three-column osteotomy. Total operative time in min. 184 patients (67.6% [95% CI 61.7–73.2%]) experienced 515 non-neurologic events. Sixty-three patients (23.2%) had one non-neurologic adverse event, and 121 (44.5%) suffered from multiple adverse events. There were 300 (58.3%) perioperative and 215 (41.7%) late adverse events. There were 234 AEs classified as major (in 121 patients, 44.5%) and 281 as minor (in 142 patients, 52.2%). Overall, the most frequently encountered non-neurologic adverse events were surgery-related (27.6% of all non-neurological adverse events [AEs], occurring in 39.7% of the patients), implant failure (9.1% of all non-neurological AEs, occurring in 14.7% of the patients) and dural tear (8.3% of all non-neurological AEs, occurring in 15.8% of the patients). For perioperative adverse events, surgery-related complications accounted for 27.3% of all the non-neurologic adverse events, followed by urinary tract infections (9.0%) and wound-related problems (6.7%). The mentioned perioperative adverse events occurred in 25.7%, 9.2% and 7.4% of the patients. For late adverse events, implant failure (20.9%), wound-related problems (6.5%) and loss of correction (6.0%) were most commonly reported and affected 14.3%, 4.0% and 4.8% of the patients, respectively. Table 3 summarizes all the adverse events that were noted. 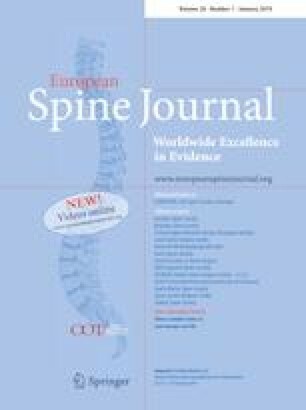 Four factors were identified to be associated with an increased risk of any non-neurologic adverse event in univariable analyses: previous spine surgery performed (OR 3.02, 95% CI 1.79–5.12, p < 0.001), ASA grade (grade III and IV vs I and II OR 2.46, 95% CI 1.43–4.24, p = 0.001), age (OR per 10-year increase = 1.31, 95% CI 1.11–1.54, p = 0.002) and number of documented non-neurologic comorbidities (OR per each additional comorbidity = 1.22, 95% CI 1.02–1.46, p = 0.032,) (see Table 4). Patients undergoing a three-column osteotomy did not have a significantly higher odds for experiencing a non-neurological complication, neither in the unadjusted (OR 1.51; 95% CI 0.85–2.69; p = 0.161) nor in the adjusted analysis (see Table 5, OR 0.98; 95% CI 0.49–1.93; p = 0.945). On multivariable logistic regression analysis, previous spine surgery (OR 2.35, 95% CI 1.29–4.27, p = 0.005) was the only independent factor found to have a statistically significant association with non-neurologic adverse events. In addition, there was some evidence, although of borderline significance, that a higher ASA grade (grades III and IV vs. I and II) might increase the risk of non-neurological adverse events (OR 1.94, 95% CI 0.99–3.80, p = 0.052) (see Table 5). This present study of the prospective, multicenter, international study (Scoli-RISK-1) database provided three major findings. First, the incidence of non-neurologic adverse events following surgery for severe and complex ASD was 67.6%. Second, the most frequent non-neurologic adverse events were surgically related (27.6% of the AEs occurring in 39.7% of the patients), of which implant failure and dural tear were most common. Third, on multivariable logistic regression analysis, previous spine surgery (OR 2.35, 95% CI 1.29–4.27, p = 0.005) was the only independent factor found to have a statistically significant association with non-neurologic adverse events. Most of the previous reports on complications after ASD surgeries have been based on retrospective data with heterogeneous inclusion criteria, which affect accuracy and can lead to under-reporting and biases [1, 2, 3, 5, 7, 9, 10, 11, 12, 15, 17, 19, 20, 23, 28, 29]. Analysis of neurologic adverse events from this Scoli-RISK-1 database suggests a much higher adverse event rate than those reported in the literature . A recent study showed that when compared with the prospective Scoli-RISK-1 report, retrospective cohort analysis underestimates neurological deficits in complex ASD surgeries by twofold . Additionally, there have been no reports which specifically focus on non-neurologic adverse events after ASD surgeries. Although postoperative neurologic decline can have severe consequences, the number of and serious adverse events are also predictive factors of 2-year health-related quality of life (HRQOL) scores after surgery . Hence, an accurate and thorough knowledge of the true incidence, types of and risk factors for non-neurologic adverse events after complex ASD surgeries are crucial to surgeons and patients. The Scoli-RISK-1 study is a multicenter international study that uses a prospective design to collect a complete risk profile of patients undergoing complex ASD surgeries. Only such a design can give accurate information regarding the rate, type and outcomes of perioperative complications, which are fundamental for informed decision making, risk stratification, preoperative planning and optimization of patients. The overall incidence of patients with at least one non-neurologic adverse event was 67.6%, with a slightly higher rate during the perioperative than late period (53.7% vs 42.3%). Many authors have reported perioperative complication rates after ASD surgical treatment [2, 3, 4, 6, 7, 9, 10, 15, 19, 20, 25]. A recent comprehensive review of the literature on complication rates after surgery for ASD found an overall complication rate of 55% . However, these series suffered from methodological limitations including retrospective nature, single-centered, heterogeneous inclusion criteria, non-standardized reporting, lack of data monitoring and loss to follow-up. Retrospective analysis of three prospectively collected databases showed variable complication incidences from 17.65 to 68.24% , with the absence of certain complications. Even when studies concentrate on three-column osteotomy patients, the reported complications were only between 31.8 and 35.2% [1, 6]. This reflects the inherent inaccurate nature of such databases and difficulties in interpreting such analyses. Furthermore, inconsistencies in reporting adverse events in different studies (on patient level or adverse event level) may make comparison difficult. A prospective study design is therefore crucial because only it can capture the true incidences and types of complications. Overall, the most common non-neurologic adverse events in our series were surgery-related complications (27.6% of all non-neurological AEs affecting 39.7% of the patients) with implant failure (9.1% of all non-neurological AEs affecting 14.7% of the patients) and dural tear (8.3% of all non-neurological AEs affecting 15.8% of the patients). In a recent systematic review of all complications after ASD surgery, apart from neurologic deficit, infection (2.4%) and instrumentation failure (1.3%) were the most common causes of major perioperative complications, and instrument-related failure was the leading cause of long-term complications . A retrospective analysis of ASD surgery patients found the rates for superficial and deep infection were 5.5% and 3.5%, respectively, and obesity and prior history of wound infections were independent risk factors. The rates of these leading causes of non-neurologic adverse events also seemed to be higher in our series than those reported in the literature previously. Compared with the only other prospective multicentered study in the literature , the rates of infection were similar (13.2 vs 14.8%) but the implant failure rates were even higher in Smith et al.’s series (9.1 vs 27.8%). The identification of risk factors for developing complications after ASD surgery has been previously reported in the literature. However, these factors were analyzed from all documented complications, which may have different contributing factors. Soroceanu et al. focused on medical complications alone and identified smoking, hypertension and duration of symptoms as independent risk factors. In our study, through a univariable analysis, we identified age (per 10-year increase, OR 1.31), previous spine surgery (OR 3.02) and ASA grade (I and II vs. III and IV, OR 2.46) as risk factors for developing a non-neurologic adverse event. Using multivariable logistic regression analysis, only previous spine surgery (OR 2.35) was identified as an independent risk factor. We further subdivided all adverse events into major and minor according to Glassman et al. and identified risk factors for developing a major non-neurologic adverse event. On both univariable and multivariable analyses, age (per 10-year increase) and previous spine surgery were risk factors for developing a major non-neurologic adverse event. Interestingly, previously reported risk factors in the literature including BMI, number of documented non-neurologic comorbidities, operative duration, blood loss and preoperative neurologic status were not significant risk factors in our study. The number of risk factors that could be analyzed was limited by the number of patients with/without non-neurologic adverse events to ensure validity of the analysis and to avoid overfitting . Dural tear was one of the most frequent non-neurologic adverse events, and the strongest predictor for non-neurologic adverse events in this series was previous spinal surgery. In general, dural tear usually occurs when the spinal canal is opened or when the dural sac is manipulated intraoperatively. This surgical step is the classical scenario that occurs in a posterior osteotomy during a revision surgery, thereby putting revision spinal surgeries at higher risks of dural tears. In a recent prospective series on complication rates associated with three-column osteotomy, Smith et al. found a similar complication profile with 78% of patients having at least one complication, with rod breakage (31.7%) and dural tear (20.7%) being the commonest complications reported. However, they did not find any risk factors that predicted the occurrence of complications. Interestingly, similar complications have also been found in the correction of cervical and cervicothoracic deformities , suggesting a high complication rate is to be expected when performing deformity correction irrespective of the anatomical site along the spine. Patients with complex ASD present to spine surgeons with pain, neurologic symptoms, deformity, disability and cosmetic concerns. Neurologic decline can have devastating consequences, but occurrence of non-neurologic complications is also of clinical importance after surgical interventions. Knowledge of the incidence and types of non-neurologic adverse events that may occur, the likely period of when they may occur, and the risk factors that predict their occurrence is important in preoperative counseling and optimization of such patients. The prospective, multicenter and international nature with validated data collection, rigorous monitoring and detailed review by a CEC are key strengths of this study. The results of this study complement the previous report on neurologic complications from the Scoli-RISK-1 study  and give the complete risk profile for any patient undergoing complex ASD surgery. There are several limitations to our study. First, the inclusion criteria consist of patients with severe and complex ASD who may be prone to higher perioperative risks and the results are not directly applicable to all ASD surgeries. Second, although the inclusion criteria of severe and complex ASD were well-defined, the patient population and the deformities were inevitably heterogeneous. Third, owing to the comprehensive and extensive data collection, several relatively rare non-neurologic adverse events could not be categorized, rendering the risk analysis of these adverse events not possible. Fourth, it is worth noting that adverse events have been reported in this study. It has been reported that adverse events may occur frequently during spinal surgery, but the majority of these may not be associated with complications . However, we feel that a comprehensive understanding of all aspects of adverse events is more informative to surgeons and patients when assessing the risks and safety of complex ASD surgeries. Fifth, the categorization of adverse events into major and minor according to Glassman et al. was specifically developed for adult spinal deformity surgery, but it can be considered too simplistic. Street et al. has recently developed a more comprehensive prospective grading for the severity of adverse events. This system can give a more accurate reflection on how the adverse events have affected individual patients. Sixth, even though 15 high-volume academic sites worldwide participated in this study, enrollment was not uniform across all participating centers, which may affect the applicability of these results to all spinal deformity surgeons. To our knowledge, the Scoli-RISK-1 study is the first prospective, multicenter and international study that evaluated non-neurologic adverse events after complex ASD surgeries and found a rate of 67.6% after 2 years of follow-up. Previous spine surgery was identified as a significant independent risk factor for developing non-neurologic adverse events. In addition, there was some evidence, although of borderline significance, that a higher ASA grade might increase the risk of non-neurological adverse events. The authors acknowledge the surgeons, collaborating centers’ local clinical research personnel, and support staff for their active participation in the Scoli-RISK-1 study. Funding received to conduct Scoli-RISK-1 was from the Scoliosis Research Society and AOSpine International. The study was managed by AOSpine International, through the AOSpine Knowledge Forum Deformity. Study support was provided directly through AOSpine’s Research department and AO’s Clinical Investigation and Documentation unit. The authors would especially like to thank Kathrin Espinoza for statistical assistance. AOSpine is a clinical division of the AO Foundation—an independent medically guided nonprofit organization. The AOSpine Knowledge Forums are pathology-focused working groups acting on behalf of AOSpine in their domain of scientific expertise. Each forum consists of a steering committee of up to 10 international spine experts who meet on a regular basis to discuss research, assess the best evidence for current practices and formulate clinical trials to advance spine care worldwide.